Socks, prepare yourselves to be knocked right off! 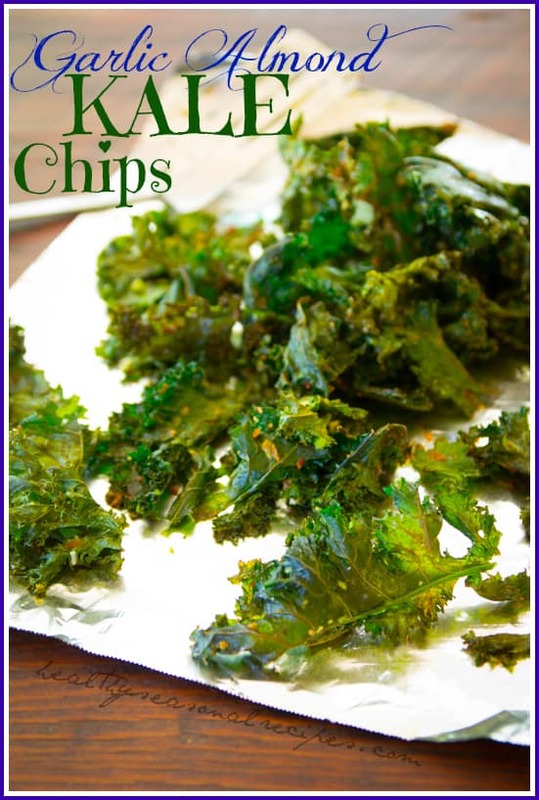 Because I’ve got some Garlic Almond Kale Chips and my top 3 tips on how to get perfect kale chip texture today. You may think I’m exaggerating, but trust me, one bite of these addictively crispy, savory, garlicky whole-food snacks and your socks are going to get knocked- nay-blasted right off! 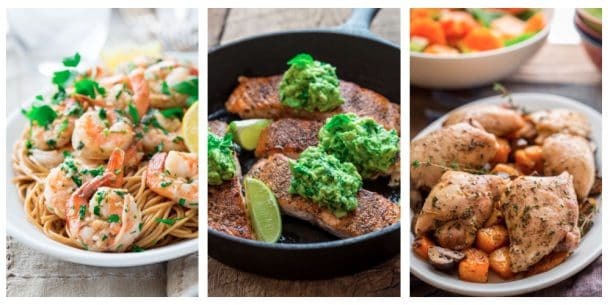 I originally shared this recipe on August 26, 2013. I have updated the images and some of the text today. The phone rang shortly before dinner the other evening and I knew it was a food question. I have a handful of friends and relatives who call around this time of day to ask quick questions about cooking this or that. To be honest, I am thrilled to be getting these calls. It is not only completely flattering that these people think of me to ask these types of questions, but I also love being put on the spot. Like a mini culinary pop quiz. That evening it happened to be my neighbor Jenny who had just come in from the garden with an armful of kale. She wanted to know my kale chip recipe. We chatted for a few minutes, and I sent her off to her kitchen to have fun with her kids making kale chips. 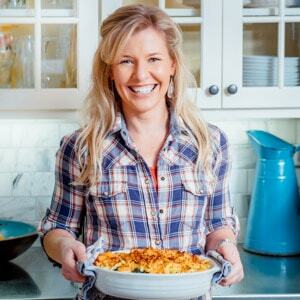 When I hung up I knew I’d have to add this recipe to the top of my list of recipes to-blog about. I told her that I do have one, but it wasn’t written down. I explained how I make them, and what to watch out for. I make this recipe for my kids all the time. We love them so much that between the two girls and me, two sheet pans will disappear in no time. So just know that the recipe makes eight servings, but in our house it is actually three. 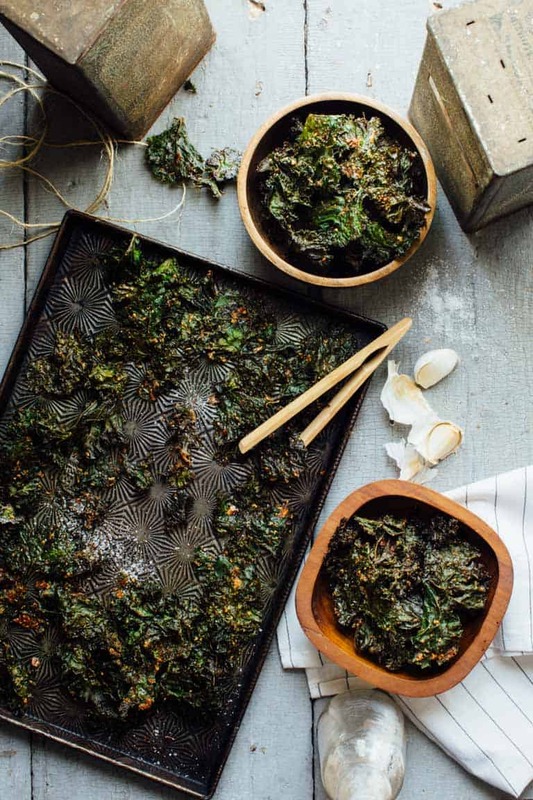 I started making kale chips this way when another friend, Carolyn told me about this technique with garlic, nuts and bell pepper a few years ago. It was originally meant to be prepared in a dehydrator, but since I don’t own one, I just adapted it for the oven. You just puree a pepper with garlic, nuts and oil and then coat the kale leaves in the mixture. And then bam… in 30 minutes you have a crunchy, slightly salty, totally addictive super snack that your entire family will be fighting over! Space out the kale. Make sure the kale is spread out evenly on the baking sheet. Use a cool oven. The oven needs to be pretty gentle, say 325 degrees. 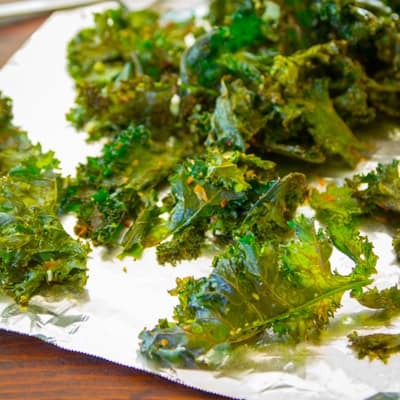 Like toasting nuts or coconut, these kale chips can go from toasty to burnt in seconds, having a cooler oven helps prevent that from happening. Rotate the pans. Make sure you rotate your pans. With two pans in the oven there can be hot spots in the oven, so it is helpful to rotate them to make sure the chips cook evenly. 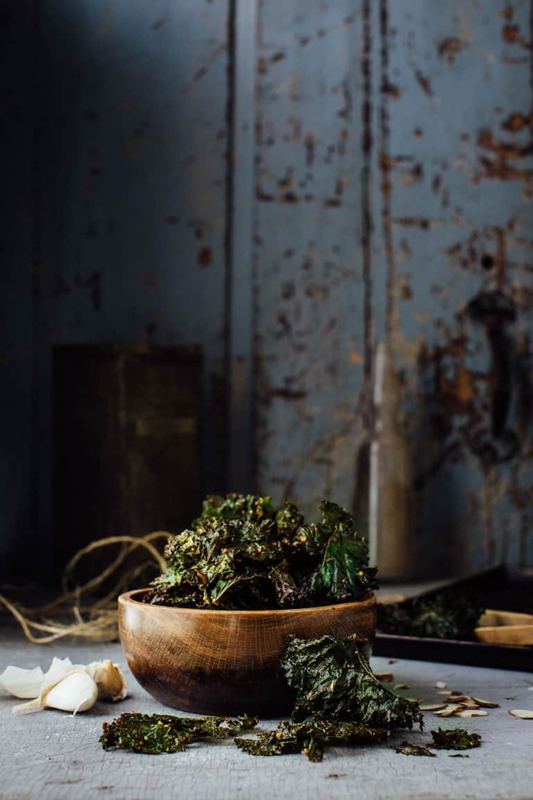 So now you are armed with all the tips and information you need to successfully make the yummiest and most crave-worthy snack around… Garlic Almond Kale Chips! 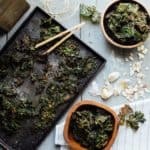 Garlic Almond Kale Chips are a gluten-free and vegan Super Snack that are ready in just 30 minutes and will totally knock your socks off! Arrange two oven racks evenly spaced in upper and lower third of oven. Preheat oven to 325 degrees F.
Fit steel blade attachment in food processor and turn on. Drop garlic clove through feed tub and allow to process until finely chopped. Open and add pepper, almonds, oil and salt and process until a thick paste forms. Scrape pepper mixture into a very large bowl. Spread around surface of bowl. Add kale and toss to combine. Work pepper mixture by hand into the leaves of all the kale to make sure it is evenly coated. Spread over two large baking sheets. 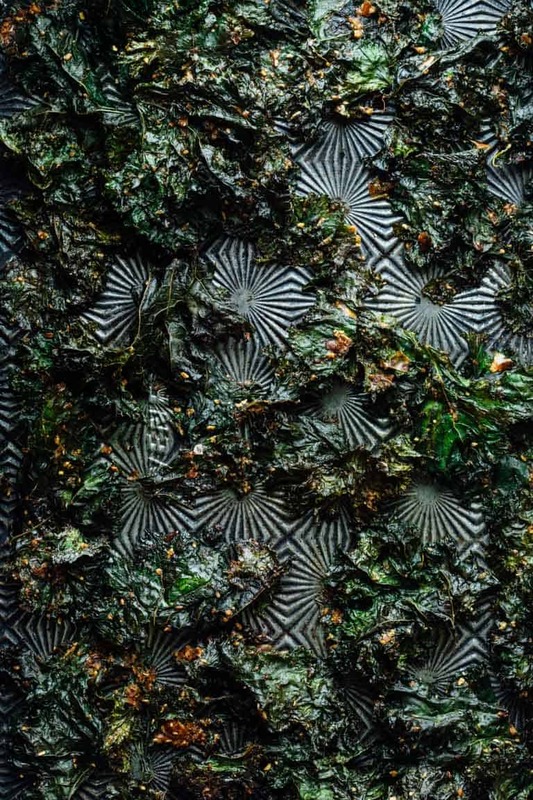 Transfer kale to oven, and bake 10 minutes. Rotate baking sheets top to bottom and front to back. Continue baking, rotating again until crisp, but not brown 5 to 10 minutes more. Let cool before eating. I loooove making kale chips!! Love the addition of the almonds! Thanks Ari! I just brought more kale in from the garden today, so it looks like snack time is covered!